I have the honor of knowing one of our local DuPage township’s snowplow drivers. He and I had a brief, but insightful conversation recently. In light of the impending blizzard coming our way, I thought I’d share this list of the top 10 things you should now when it comes to the folks who keep our roads clear for us. The snowplow operator is not purposely trying to block your driveway. Depending on the amount of snow, there is very little that the plow driver can do to keep from pushing some snow in front of your driveway. Please do not take this personally – they are doing the best they can. You should not leave your car parked on the street whenever it is expected to snow in excess of 2″. It is not an easy task to maneuver a 10-ton truck fully loaded with salt around vehicles left on the roadway – no matter how skilled the snowplow operator is. Remember, these people are your friends when it snows – the quicker they can get around without maneuvering around parked cars, the quicker you will be able to get back on the roadway. Most cities in DuPage County have ordinances against this anyway. Keeping major roadways clear is the first priority. Your street may be very important to you, but unless you live on a main thoroughfare, please be patient; the plows will get to you eventually. Major roadways and roads leading to hospitals and emergency centers are a major priority. Ambulances and emergency vehicles need to get through. Keep your distance. Do not follow a snowplow too closely. First, your vehicle will likely get pelted with salt as it spread on the road. 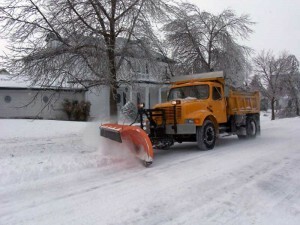 Second, if you are too close, you cannot see around a large snowplow; depending on the location and conditions, the plow may need to stop suddenly or make unexpected maneuvers. Give snowplows extra room to do their job. The operator has to focus on many things at once – where to move snow, watching the road, watching for other vehicles and obstructions, etc. Do not change lanes right in front of a snowplow. Plows need to keep their momentum in order to effectively clear the roads of snow and slush. The plow can not effectively divert the snow off the roadway at very low speeds. Snowplows are big, heavy, lumbering, trucks; they are not agile sports cars that can maneuver or stop quickly.